Since we're in the middle of planting season, we thought we'd remind everyone of the power of compost. Composting is a natural process that's been going on for thousands of years. Yard trimmings--whether grasses, leaves, brush or tree limbs--all contain microorganisms as well as earthworms, centipedes and other organisms that if the conditions are right, munch on the green waste, eventually "composting" it into nutrient-rich soil. Compost plays a large role in making plants stronger and healthier and even makes their fruit much tastier. Here are some tips when filling your green waste recycling bin. 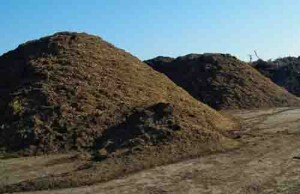 Toss in "green" waste (i.e., grass clippings, other plant materials) that is high in nitrogen and "brown waste" (i.e., dry leaves, straw, twigs, sawdust and wood chips) that is high in carbon. Leave out plants treated with herbicides, manure, meats, fats, oils, dairy products and charcoal ash--and of course, any plastics, metals and non-organic materials. The composting process is the same whether composting at home or by a professional composting company. It all begins with creating alternating layers of green and brown materials that are then mixed together. At-home composting piles should be about 3 to 4 feet high. Professional composting operations create long composting rows of over 8 feet high. No matter the size, in just one to three days, the temperature in the pile rises--a sign that the microorganisms are doing their job. When the temperature drops after a week or so, the pile is turned and moistened. This effort brings fresh oxygen to the microorganisms so they can continue breaking down the waste. Any dry materials are moved to the center of the pile. Once the pile is turned and remoistened, the temperature of the pile will raise again. The ideal compost temperature is at least 131 degrees. This level of heat will kill most weeds and disease-causing organisms. When the microorganisms have finished their work, the compost pile will have a dark, rich look. The compost then "cures" before it can be used in garden beds around trees and in flowerpots. Compost has many benefits to farmers, landscapers and backyard gardeners. Compost has a naturally high nutrient content, retains water, prevents soil erosion and reduces the need for chemical fertilizers. Farmers use compost for enhancing both row crops and orchards. Landscapers use compost as a soil amendment and for decorative purposes on commercial and private properties. Public agencies including cities and school districts use compost for landscaping parks, median strips, football fields, schoolyards and recreational areas. Homeowners use compost to enrich gardens and improve the soil around trees and shrubs. And, by using compost, we all keep green waste out of landfills, which reduces greenhouse gas emissions. For more information about composting, go to www.agromin.com.